More Companies See Advantage to Manufacturing in the U.S. It began as a ripple and is becoming a powerful wave. I’m talking about the reverse migration of manufacturing from China to the U.S.—known as reshoring—that appears to be gaining momentum. At first the evidence was primarily anecdotal, as companies such as NCR (NCR), All-Clad Metalcrafters, Master Lock (FBHS), Peerless Industries (PMFG), and Ford Motor (F) announced plans to shift certain manufacturing operations from China to the U.S.
Now, as more companies make similar announcements, what began as a trickle is building into an unmistakable trend. Further evidence can be seen in a new BCG survey of U.S.-based executives, more than half of whom told us they already have plans to bring production back to the U.S. or are actively considering it. What we learned from the more than 200 survey respondents was eye-opening (though not surprising): Some 54 percent of the respondents told us they’re planning to reshore or seriously considering it. Asked the same question in February 2012, just 37 percent of respondents were considering such plans. The new survey also found a significant increase in the percentage of companies that already have taken steps to shift production back to the U.S. On this question, 21 percent of respondents said they’re “actively doing this” or will do so “in the next two years.” This was more than double the 2012 percentage. The main factors driving the reshoring decision were labor costs (cited by 43 percent of respondents), proximity to customers (35 percent) and quality (34 percent). Other factors included access to skilled labor, transportation costs, and supply-chain efficiencies. The findings confirm that reshoring is more than just a buzzword; it’s a fact of life. When executives consider the total cost of production for many products, especially those intended for the U.S. and other developed markets, the advantage now often shifts to the U.S. Labor costs, workplace flexibility, energy costs, productivity, proximity to market—they all add up to a growing U.S. advantage, which means more and more companies will continue to shift production to the U.S. This means jobs. As we explained in August in one of our recent “Made in America, Again” reports, Behind the American Export Surge, reshored production from China, combined with production that’s being shifted from Europe and Japan to the U.S., could create 2.5 million to 5 million new factory and related service jobs by 2020. As China gradually shifts its manufacturing emphasis from the export market to the domestic market, reshoring is likely to have less impact on the Chinese economy than it will on the U.S. economy. 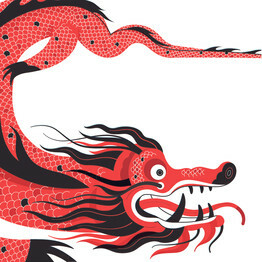 Assuming the Chinese economy doesn’t tank—and there’s no reason to believe it will—Chinese factories will have plenty to do to keep up with growing consumer demand at home and elsewhere in Asia. And don’t forget: The fact that it makes good economic sense to reshore some manufacturing doesn’t mean it makes good economic sense to reshore all manufacturing. 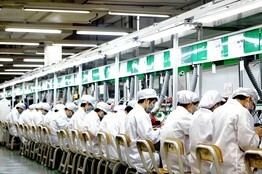 Chinese factories are not about to go silent. As the global economy continues its slow-but-steady recovery, there will be plenty of work to go around. Despite a prolonged slide in domestic sugar prices, U.S. candy makers are expanding production in other countries as federal price supports and a global glut of the sweet stuff give an ever-greater advantage to foreign rivals.A 50% drop in U.S. sugar prices in the last two years hasn’t been enough to eliminate problems from a longtime price gap between domestic and foreign sugar. On Friday, the U.S. sugar contract in the futures market settled at 22.28 cents a pound, or 14% higher than the benchmark global price. U.S. prices can’t fall much lower because of a federal government program that guarantees sugar processors a minimum price. The rest of the world also has a surfeit of sugar, but fewer price restrictions, and big growers like Brazil are expecting a record crop for the current season. The squeeze explains why Atkinson Candy Co. has moved 80% of its peppermint-candy production to a factory in Guatemala that opened in 2010. That means it can sell bite-size Mint Twists to retailers for 10% to 20% less. 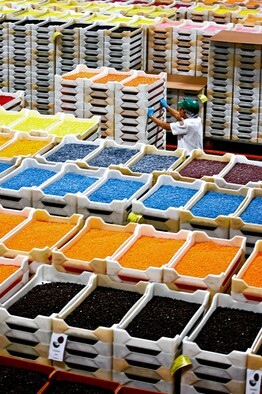 Jelly Belly Candy Co. is finishing its second expansion of a factory in Thailand that was opened by the Fairfield, Calif., company in 2007. 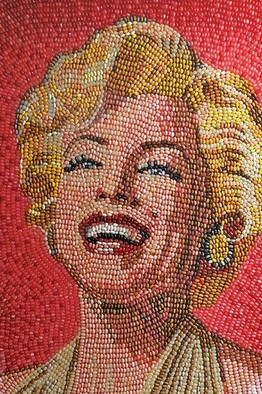 The sixth-generation family-owned firm sells about 20% of its jelly beans, made in flavors from buttered popcorn to very cherry, outside the U.S.
Sugar makes up about half of the ingredients and cost of a typical jelly bean, said Bob Simpson, Jelly Belly’s president and chief operating officer. Thailand is the world’s fourth-largest sugar producer and gives Jelly Belly access to cheaper sugar, labor and other raw materials than the candy maker has in the U.S.
“You can’t compete shipping finished U.S. goods” anymore, Mr. Simpson said. In the U.S., Jelly Belly has had to raise prices “several times” in the past 10 years due to high sugar prices. Some U.S. candy makers blame the federal government’s sugar policy, set by Congress and administered by the Agriculture Department. Loans, marketing allotments and import restrictions guarantee a minimum price of about 21 cents a pound to domestic sugar processors. Sugar users say the protections inflate wholesale prices, hurt profit margins and sap the competitiveness of U.S. candy makers in the global market. The price-support program’s defenders say it is an essential safety net for domestic sugar growers and processors besieged by record imports from Mexico. U.S. government-backed loans are the only option for some processors that need access to financing, according to the American Sugar Alliance, an industry group. Without the current U.S. sugar policy, 90% of the 142,000 sugar-growing and processing jobs in the U.S. would be in danger, the industry group estimates. The alliance also says that sugar makes up an extremely small percentage of the retail cost of candy and has little impact on U.S. jobs. From 2000 to 2012, the average price of U.S. sugar was more than double the world-wide average, according to pricing data from the ICE Futures U.S. exchange, where both the U.S. and global contracts are traded, and the Agriculture Department. 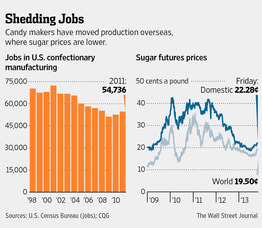 Total U.S. confectionary-manufacturing employment sank 22% to about 55,000 jobs in 2011 from 1998, according to an analysis of U.S. Census Bureau data by The Wall Street Journal. The number of industry manufacturing locations fell 7.7% to about 1,600 in the same period. Three candy-making jobs are lost for each sugar-growing and processing job saved by higher sugar prices, according to a Commerce Department report in 2006. In a sign that candy makers are taking advantage of lower sugar prices elsewhere, the amount of sugar contained in imported products surged 33% from 2002 to 2012, according to the Agriculture Department. For many types of candy, there is no substitute for sugar. The gap has caused some U.S. companies to abandon their longtime resistance to moving at least some production to cheaper countries. Financial pressures have grown because rising costs for labor, utilities, packaging, freight and health care in the U.S. make it impossible to lower candy prices when the cost of sugar drops, some candy makers said. “There are years where we are at a great disadvantage to the world users of sugar when prices are rising,” said Pierson Bob Clair, president and chief executive of Brown & Haley, a Tacoma, Wash., candy maker that produces 55,000 pounds of Roca butter-crunch candy a day in the U.S. Mr. Clair said he would “lower the price of my products” if the sugar program was eliminated. Proposed legislation to overhaul the sugar program was narrowly defeated in the House and Senate earlier this year, and aides to lawmakers don’t see any changes in the coming farm bill. Atkinson’s move to Guatemala didn’t affect production of brands such as the Chick-O-Stick and Coconut Long Boys because they contain less sugar than Mint Twists. They are still made in the U.S. But the individually wrapped peppermint candies, made with natural cane-sugar syrup and peppermint oil, are 60% sugar. Less than one-fourth of the candy maker’s total production has been moved outside the U.S., but the percentage being produced abroad is growing, said Mr. Atkinson. 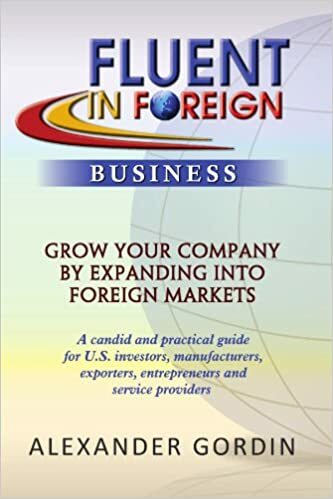 The foreign expansion, including a second shift just added at the factory in Guatemala, helps the company sell its products at lower prices that appeal to larger retailers. “We would prefer to be able to make candy in the United States,” he said. A terrific opportunity to get on the ground floor of the planned significant expansion for this 25 year-old parent of Fluent In Foreign! The Internet we each see every day is an infinitesimally tiny sliver of the whole—the parts we have curated for ourselves, the parts our network of friends and family sends to us, and the sites that we have made parts of our routines. But beyond this micro-level editing, there are also macro forces at work: The Internet largely exists for and is created by the people who are on it. The map above gives a rough idea of who those people are—or, at least, where they are. 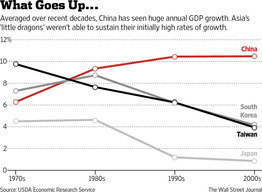 China, of course, dominates both. But what is interesting in comparing the two is how outsized Europe and South Korea are in the Internet population map, captured in their darker shading. In fact, all but four of the countries with more than 80 percent of their populations online are in Europe: South Korea, New Zealand, Qatar, and Canada. Together with much of Europe, these are the parts of the world that have gotten the vast majorities of their people online the fastest. First, the rise of Asia as the main contributor to the world’s Internet population; 42% of the world’s Internet users live in Asia, and China, India, and Japan alone host more Internet users than Europe and North America combined. Second, few of the world’s largest Internet countries fall into the top category (>80%) of Internet penetration (and indeed India falls into the lowest category, at <20% penetration). In other words, in all of the world’s largest Internet nations, there is still substantial room for growth. In the last three years, almost all North African countries doubled their population of Internet users (Algeria being a notable exception). Kenya, Nigeria, and South Africa, also saw massive growth. However, it remains that over half of Sub-Saharan African countries have an Internet penetration of less than 10%, and have seen very little grow in recent years. 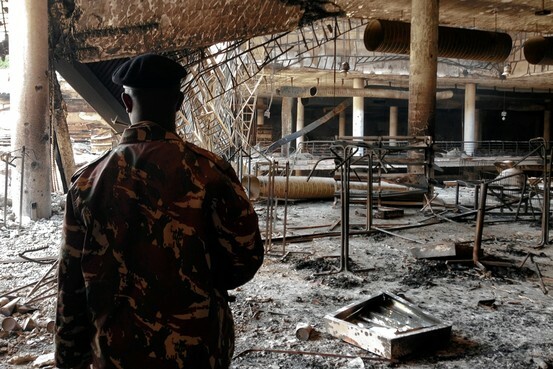 NAIROBI, Kenya—When Islamic militants killed dozens of people at Nairobi’s Westgate mall last week, they also battered one of Africa’s homegrown corporate success stories and set back a rising economy. Gunmen entered the Nakumatt retailer shortly after the assault began on Sept. 21, spraying bullets across the aisles as some shoppers tried to climb the shelves and others cowered with their children in a store room. Those who failed to recite Islamic prayers were executed. 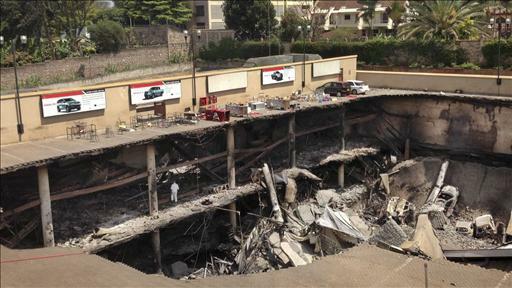 The four-day standoff killed at least 67 people, injured hundreds and left a shining symbol of emerging Africa, Nakumatt Holdings Ltd., in tatters. Nakumatt, which sells everything from bananas to bicycles, earns more than a 10th of its $500 million in annual revenue from its flagship Westgate store, whose destruction is a major blow to the company, said Atul Shah, managing director of Nakumatt Holdings Ltd. Three of his employees were slain in the attack. “We are still trying to believe this is not real,” he said. “‘What next?’ is the question I’m asking.”The question is also weighing on the minds of many investors in Kenya. Like Africa’s other dynamic economies, the country has troubled neighbors, in this case Somalia, whose terror group al-Shabaab claimed responsibility for the attack. The Westgate attack is a reminder of how easily extremists with guns can move across porous borders to strike at pockets of African prosperity. “There’s always going to be that lingering fear now: Can this happen again?” said Biniam Yohannes, who manages a fund in Nairobi with $150 million invested in East Africa. Somalia is still emerging from two decades of civil war. African peacekeepers have pushed al-Shabaab out of its Somalian strongholds, including the capital, Mogadishu, but militants have shown they are still capable of violent attacks inside the country and beyond. Before the Westgate attack, Kenya’s economy was humming. Nairobi, the capital, is a hive for African technology firms and multinationals. Kenya’s statistics agency said Tuesday that the economy grew at an annualized rate of 4.3% in the second quarter and 4.4% in 2012.Moody’s Investors Service said last week that the Westgate attack would likely shave 0.5 percentage points off Kenya’s economic growth this year and curtail critical foreign currency earnings mainly due to the likelihood of fewer tourist visits to the country’s national parks and beaches.Among the biggest potential victims are the companies riding Kenya’s emerging consumer class. Restaurants, hotels and consumer-oriented manufacturers are expected to all feel the pain if Kenyans stay home and foreign visitors curtail spending. “Kenyans need to be urged to spring back and continue doing whatever they are doing, defy all the doings of terrorists and support growth,” said Nakumatt’s Mr. Shah. Mr. Shah, 53 years old, was raised in the dusty Rift Valley town of Nakuru, where he grew up working in his father’s mattress store. In the late 1980s he dreamed of converting it into a chain of Western-style grocery and retail outlets, opening his first store in Nairobi in 1992.Today Nakumatt is East Africa’s top retailer by sales and revenue, with 40 stores across Kenya, Uganda, Rwanda and Tanzania. Before the Westgate attack, Mr. Shah was developing plans to open six stores this year in Kenya and Uganda. He still hopes to do so. Its Westgate store, in the heart of Nairobi’s embassy district, attracted the city’s comfortable and cosmopolitan upper crust. Mr. Shah visited the store himself on the morning of the attack, and he had just settled into his office near the airport when his wife called him screaming. A Kenyan policeman walks through the remains of the Nakumatt store in Nairobi’s Westgate mall on Tuesday, days after Islamist militants attacked. After avoiding malls for a week, Mr. Yohannes, the private equity director, said he started shopping again at a Nakumatt two blocks from Westgate. Such a yearning for normality, says he and others, points to the potential recovery for Nakumatt, a pillar of daily life for many East Africans, and other retailers. “Consumer demand is still intact—people still need reliable goods and services and suppliers need to keep up,” said Vimal Shah, who heads an edible oils manufacturer that supplies Nakumatt and isn’t related to its owner.On Tuesday, Kenya’s President Uhuru Kenyatta pledged to keep the country on track and punish the perpetrators. “We fought back as one people and continue to heal our grievances together,” he told a multi-faith prayer service in honor of those killed.He also announced a government inquiry into the police and army’s response to the attack.